There were 476 press releases posted in the last 24 hours and 153,738 in the last 365 days. 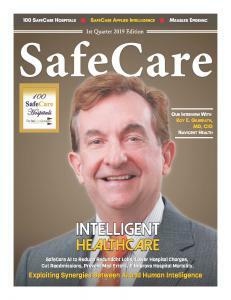 LEXINGTON, KY, USA, April 9, 2019 /EINPresswire.com/ -- SafeCare magazine announced today the release of its special Intelligent Healthcare edition focusing on how artificial intelligence can offer predictive insights to aid proactive real-time decision support and target opportunities of care. “We have a detailed array of articles that will explore synergies between artificial intelligence (AI) and human intelligence (IQ). 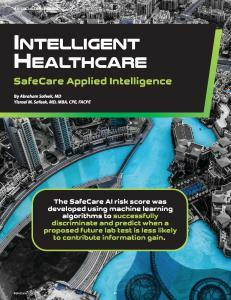 In this issue, we are taking an in-depth exploration into how The SafeCare Group® has spearheaded and revolutionized the field of AI within healthcare to realize game-changing clinical, operational, and financial opportunities for hospitals,” stated Editor-in-Chief Sarju Bharucha, JD. 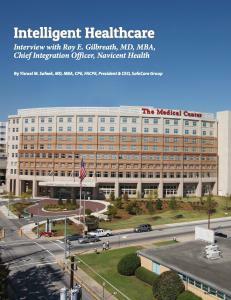 Additionally, we have our cover story interview with Roy E. Gilbreath, MD, MBA- Chief Integration Officer of Navicent Health. We are also excited to bring you 100 SafeCare Hospitals – The Sixth Annual Release: For 2019, Cleveland Clinic and Mayo Clinic are at the top of the list! We appreciate our readers and strive to deliver information on the people, ideas, organizations and novel technologies affecting safe, efficient, and quality healthcare to the sector’s most influential leaders. Thus, feedback from subscribers and advertisers alike are welcome, as your input is highly valued. The SafeCare Group® was founded in 2010 and its motto is “Innovating, Disrupting, Transforming” healthcare. Since 2016, The SafeCare Group invested heavily into Artificial Intelligence (AI) to realize game-changing clinical, operational, and financial opportunities for hospitals. We call it SafeCare Applied Intelligence™ or SafeCare AI™ for short to improve healthcare efficiency, quality, and patient safety. SafeCareSoft™ SaaS solutions enable hospitals to take advantage of disruptive healthcare software known as Softwaring Healthcare Excellence® that optimize hospital ratings and regulatory accreditation. Since 2013, 100 SafeCare Hospitals® listings have been Recognizing Healthcare Excellence® of 100 US hospitals that excelled with low infections, readmissions, complications, high patient satisfaction, and high value. For more information about The SafeCare Group, visit www.safecaregroup.com.